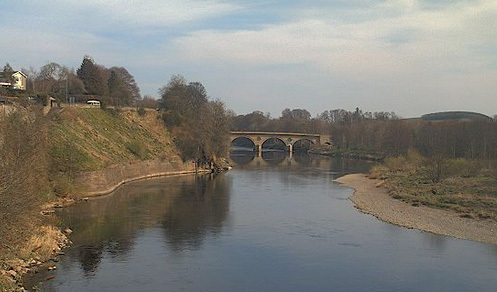 Monday 16th March Well some fish did come charging inbut unfortunately went charging straight past us to the Kelso area again, it has been the best days catch on the river this year with both Junction and Sprouston getting 8 a piece so well done them, Upper Floors getting 4 and Birgham Dub 3, Upper Hendersyde 4, Hendersyde 4 and Upper Mertoun 4 so a great day up river but not a fish below Birgham dub, the flood over the weekend took them all up and away, at least we know that fish are coming in so as soon as the levels drop we’ll get some! 2’7” and 40 degs squeaky clean at the Lees today cloudy skies with a cool east wind which brought rain this afternoon making it a rather dreich day. Fred Roberts and Richard fished the bottom half of the beat and the only thing to report was a Seal in the Bags, Dave Charlton and Leigh Final fished the top and didn’t see a Seal so Fred and Richard win! There was a hatch of fly this afternoon which looked like a large dark olive and I saw one brave trout taking a fly or two, in a couple of weeks the March Browns should be with us so bring a Trout rod with you as it’ll give you something to do when you get fed up catching Salmon as your aching arms will need a rest. Seriously though it’s nice to see a head of fish into the river and gives us all a bit of hope. It’ll be better tomorrow. Tuesday 17th March It was more like an November afternoon today, one of those ones where the sun never shines and its fogy and cold with a damp air except there were no fish on the Lees, the lads gave it a good thrash all round the beat but the only thing we had was a Brown Trout from the Temple. South Wark had 3 fish today two of them this morning caught by Trish Burgon queen of the Slap so the fish are getting closer to us, maybe tomorrow. The Otters were having a good play in front of the hut and there was a longer hatch of dark olives today and a couple of trout braving the cold to take them. 2’5” and 40 degs this morning and squeaky clean, we were on sinking lines and 1 Â¼ tubes which proved too much for Richards rod as it snapped straight through the middle blank while he was about mid cast (he’s Welsh) so I presume they were swear words. The forecast is saying we might get a wee peek at the sun tomorrow so at least it’ll make the day look better. 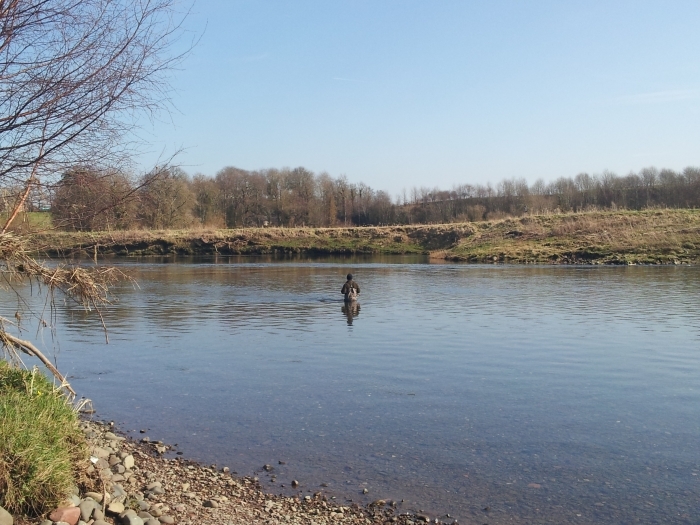 Wednesday 18th March Now then, this is a bit more like it, still no fish but the weather was warm well warmer at least and no bloody wind, it was the sort of day when we should catch a fish and I did see something big splash in the tail of the Cauld. Rodger Oxtoby and Chris Ladley joined us today and waved their rods about with a deal of enthusiasm (not seen since Chris came last at the game fair casting competition) but not hard enough to catch a fish. 2’3” and 40 degs squeaky clean, we had Otters a Kingfisher and the highlight of the day was two Sandmartins, they always brighten up my spring and you start to think the worst is behind us, they have timed it just right as the dark olives were hatching well today around midday, almost enough to make me reach for the trout rod. All three Wark beats above us had a fish each today so tomorrow must be our turn. There’s every chance the Osprey will be with us next week as it’s turned up on the 24th for the last two years. Thursday 19th March Another lovely sunny morning, frosty first thing but calm which is always a bonus, only two rods on today as two didn’t turn up for some reason. Kevin Campbell and pal Ally were ready to do battle with a Lees monster but it sadly wasn’t to be. Kevin gave a shout this afternoon in the Cauld boat as his line tightened but within seconds we soon knew it was a Kelt, a well mended one. The pair of them gave the beat a good thrash but we didn’t see a scale all day, the only good news I heard today was that Milen Graden had two fish today, so at least I know they are slowing down a bit instead of belting straight through. The river is still dropping slowly and is squeaky clean, 2’1” and 41 degs today on the Lees gauge. 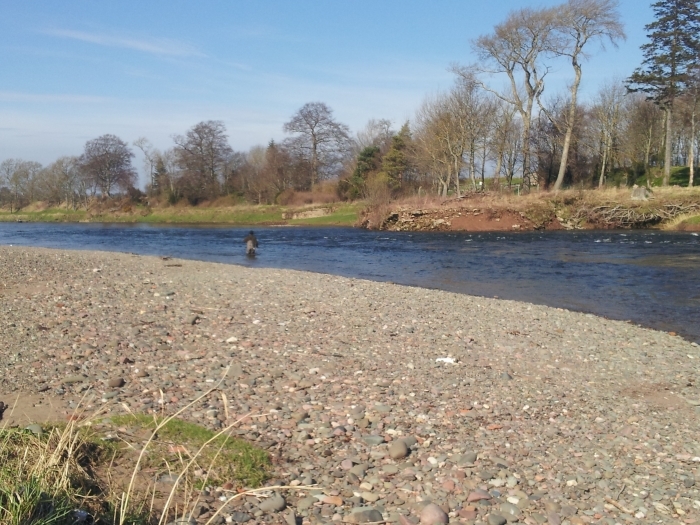 No Sandmartins today and very few trout rising and very few dark olives. Tomorrow’s rods phoned this morning and I told them not to rush in the morning as we will be fishing in the dark at 9.30am with the solar eclipse, it quite funny watching the hens going back to roost after only being up for a couple of hours then getting up again a half hour later. We might get another dawn chorus if we’re lucky, or if it had been midsummer maybe two cracks at the evening rise. It’ll be better tomorrow. Friday 20th March As the eclipse was upon us we ran through the bushes naked hitting each other with nettles and bramble stalks praying to the piscatorial gods to stop some fish on the Lees but no matter how hard we ran and how hard we whipped and prayed it did no good. The birds stopped singing, hens went back to roost, there was no evening rise but the temperature dropped a lot, then the sun came back out and we got on with the fishing. 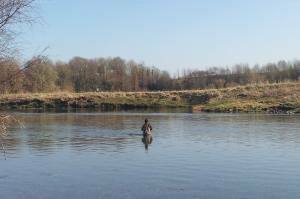 The lads today have all fished and caught on the Lees before but their combined years of experience didn’t help them today and we blanked, not only did we blank we never saw a splash, fresh fish were caught around Kelso again, not so many today so they are still sneaking past sometime. The river is in perfect nick at the moment but it needs to drop to summer level before a fish is going to stay with us it seems. There was no hatch of Olives today and no trout looking for them either, no more Sandmartins yet but the Kingfisher and the Otters kept us amused. The dugs had a grand time this morning digging up rats at the Back of the wall with Kelsae chucking them about as she was getting nipped, I fear that my Labrador might end up hard mouthed as they say but there’s more rats than pheasants on the Lees and she’s happy so there we go. 2’0” and 41 degs squeaky clean, wet 2 type lines and any fly you like as long as it’s about the right size. The forecast is for dry weather so let’s hope their correct, no rain for a month or more should do it. Saturday 21st March It appears that salmon are just like buses, none for two weeks then two come along at once. Andy Brittan was the first to score getting an 11lb fish from Learmouth stream, even better was the fact that it’s the first fish from any other pool apart from the Cauld, not to be outdone Neil Andrews had a 6lber from the Cauld in the afternoon, we also saw fish in the Bags and the Temple, what a difference it makes when the height starts to drop. It was a busier day on the river as a whole with fish being caught below us as well as above, one a 14lber liced from Upper Floors so they are still belting through if they want. There was the odd Trout rising today and we saw the first March Browns; they are the fly that really gets the Trout on the feed so I might be taking the Trout rod along tomorrow. Photos this week are the lads fishing through the Glide and Duddo.